One of the important teachings of Buddhism is the principle of suffering. According to this principle, Buddha regards suffering as the most important feature of human life and suggests some ways to be relieved of this problem. In the teachings of Islam and Shiite Imams (PBUT), although the existence of disasters and difficulties are accepted, but the suffering as a result of disasters is dependent on human’s viewpoint toward disasters and difficulties; although, suffering in Imams (PBUT) viewpoint is not equal to disaster. In this study, we will compare both views and shall study their agreements and disagreements. Buddhism is one of the ancient religions of India. Buddhism is a meditative and rational school that emerged in sixth century BC in India and in later centuries it dominated large parts of Asia. One of the important teachings of Buddhism is the principle of suffering. 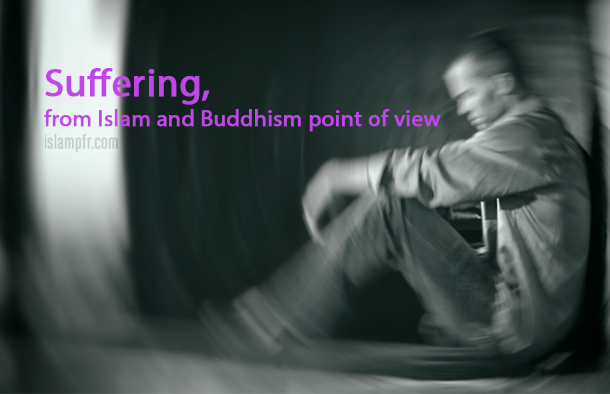 According to this principle, Buddha regards suffering as the most important feature of human life and suggests some ways to be relieved of this problem; including: true cognition, true thought, true behavior and… also, the suffering principle is mentioned in Islamic teachings and Shiite Imams (PBUH) suggested some ways to be relieved of this issue; including: reliance on Allah, having holistic view, and acceptance of divine law. In this study we are investigating if being in suffering is equal to being in a disaster or we can find a subtle and important difference between them and state that there is a difference between suffering and disaster. Suffering is a psychological and internal state that as its result humans are suffered from mental illness and nervous disorders. This state is the result of being defeated against a higher will and failure to achieve the goals and desires. But if human’s will becomes similar to the will of Allah and fades in His will, he will reach to the Contentment and does not suffer anymore; because he knows that all events of the world take place with divine permission and whatever happens is attributable to Allah and every event is the outcome of his creative will and no suffering shall remain; as Imams (PBUT) have invited us to this way in which we can be relieved of suffering. But disaster is indispensable for human life in this world by which human is tested; hence it can be said: Although Imams (PBUT) faced many disasters in their life, they did not suffer. (The Quran, Surah Al-Fajr, 27-28) “O (thou) soul, in (complete) rest and Contentment!, “Come back thou to thy Lord,- well pleased (thyself), and well-pleasing unto Him!” (Javadi Amoli, 1380, vol. 4, p. 173). The main question of the research is: What are the commonalities and differences of suffering principle from Buddha and Shiite Imams (PBUT) point of view? The Oaths before this verse, along with various emphases given in verse, and also the word “فی”, all, shows that the life of this world is coupled with difficulties and hardships and this is the providence of Allah, because He said « خلقنا» “we have created”, and human cannot be relieved of these problems and difficulties as long as he is in this world. Thinketh he, that none hath power over him? (Al-Balad, 5). This relationship shows us a reasoning in which because human created with difficulties and hardships, he cannot reach to whatever he wants or can only reach to some parts of it. So we can conclude that: from the structure of the life in this world human can understand that there is a superior will and it is Allah’s will (providence of Allah) and it is only his will that rules over the whole world (Tabatabai, 1417 AH, vol. 20, p 327); But the Creator, in addition to suffering in human life, refers to other cases; including impatience and haste of men to attain the truth; so that he will do wrong things and will unconsciously long for evil and harm to obtain his good. The above mentioned characteristics are a part of natural characteristics and states of men. Human is in hardship during his normal and natural course of life; human is naturally hasty, polemic, and greedy. He is impatient and monopolist. Stubbornness, pride and rebellion are also natural characteristics of human beings. Rejection of revealed religion (Hume, 1369, p. 91). The truth of suffering: life is suffering; suffering is endless. Birth is suffering. Illness, marriage, old age, being away from loved ones and facing unpleasant things and failure in reaching to wishes, all are suffering. There is a wish at birth that I wish I was not born; I wish there was no old age, illness, sorrow and distress after being born. The truth of origin of suffering: The origins of suffering are longing and thirst of being existent. Thirst is inexistence and this thirst is the cause of (1) In other words, the origin of suffering is lust and wish. Thirst comes from whatever which is pleasurable in the world; it means that the eyes see a picture, the ears hear a voice, the nose smells a scent, the tongue tastes a flavor, body touches something, or mind perceives something. All of these actions are pleasurable and are followed by thirst and loss of all of them. This thirst of inexistence is suffering. The truth of salvation from suffering: is to be released from the thirst and to leave it. Men should escape from this suffering and its only way is when one can harness his emotions and desires completely and constantly think and meditate on the truth; and the human will tear up all the chains that caused his captivity in this world and will be converted to a holy man (Arhat). This level is called “Nirvana”. In Buddha’s view men can be relieved of their suffering by internal powers. Buddha believes that every disaster is a suffering. The world is a home which is surrounded by a variety of disasters and calamities (Radhi, 1370, vol. 2, p. 219). But man will never suffer from anything if he reaches to the level of Contentment and be aware that everything which happens in this world is according to design of Allah and every disaster that occurs in the world including death, aging, disease, poverty, flood and earthquake are attributable to him. Therefore, not only Imams (PBUT) did not suffer from these events, but also enjoy them and regard them as beauty because they believed that they are all from Allah. Nirvana is the final goal of Buddha’s teachings that can be reached by practicing the eight ways that are mentioned in the fourth truth (Schuman, 1362, p. 82); several ideas have been proposed about its meaning among which the following are mentioned: Pusin considers Nirvana as the position of silence and joy (Shayegan, 1346, vol. 1, pp. 165-168). Also it is said that at this level the men will get out of the cycle of reincarnation (Tyluca, 127 / William, 2000, p. 47).